Okay, this is rather long, but I wanted to get it down on paper before I forgot some of the details. So, Cory asked Donna to help him find an engagement ring a few months back. It was quite the ordeal and they looked at a lot of rings, but he finally ended up finding the perfect one. Then, the planning for the engagement started. Cory wanted to ask her on the beach and Carsen had expressed in the past that she wanted pictures of the event, so plans were made to do it at Marco Island where my daughter lives. Amanda knew the perfect place and someone that could take pictures so it all seemed to be coming together. Unfortunately, Carsen couldn't make it on the weekend that was planned and they just couldn't get the dates worked out. Amanda even tried to guilt her into coming by making up a story about a family picture, but that didn't work. Cory called up Carsen's mother to see if she could help. Out of that conversation came the plans to do it at St. Augustine. There are two things that make that location really special. For one, that is where I proposed to my wife, but it is also the place where Carsen's Mom and step-dad were married and where they had their honeymoon. Actually, there is one more thing that makes it special because it was at St. Augustine, on the grounds of the old fort, on the 4th of July, 2007, that a certain young man asked me if he could marry my daughter . Needless to say, my wife and I both were pretty excited about the location. There was a lot of chaos leading up to the event. For starters, it really didn't start coming together until Wednesday, but he wanted to ask her on Friday. In addition, Cory had orientation all day Thursday for Fire College so he wouldn't really be around to help plan it. So, to make it easier to work out the plans Donna went to orientation with him on Thursday so that they could discuss everything between his sessions. In between all the planning and Fire College sessions Donna was texting her sister and Amanda to help with our hotel reservations and to find tourist information and maps of the St. Augustine area. Between the four of them they finally came up with a plan. Now we just had to do it. A big part of the plan included setting up a tent on the beach with sides that would allow Donna and I to hide inside and take pictures. When Amanda got married in December of 2007, we bought a beautiful tent for the occasion. After the wedding we moved the tent to our back yard, but I failed to secure it properly and the next day a windstorm blew it up against a fence and destroyed all the metalwork. We were devastated, but we saved the canopy and all of the sides because we knew they could be used again. This was our opportunity to use them. We have a 10X10 pop up tent and the sides would fit perfectly. My job on Thursday after work was to get the tent sides out of storage. I thought I knew where they were, but after over an hour of looking I finally gave up. I hit up Lowe's and Home Depot, but didn't have any luck. Finally, out of desperation, I bought some flat sides at Wal-Mart and headed home. Donna was just getting there when I arrived, having purchased the food for Cory and Carsen's lunch that would be served in the tent. I knew it when I bought them, but Donna let me know that the sides that I had purchased at Wal-Mart just wouldn't do. In her mind the sides had to be at the storage, so after taking care of some things around the house we headed back to the storage. Two hours and what seemed like hundreds of boxes later we still couldn't find them. I came around the corner about 10:00 that night and found Donna sitting on a cardboard box, nearly in tears. She looked up at me, "We have to have sides. The whole plan revolves around it." So, It was back to Wal-Mart, this time to find curtains. My wife, being the creative, resourceful person that she is managed to find four tan shower curtains (not the plastic ones) and six sheers that she thought would work. We also purchased shower curtain hooks, a ball of twine, a couple packs of wooden clothes pins, zip ties and some rope. Then we headed back home to pack it all up. They had checked the time for high tide and determined that the proposal had to take place somewhere around 11:30 am. It's a two and a half to three hour trip from our house to St. Augustine and we figured at least two hours to set everything up. With that time frame in mind the alarm clock went off at 4:15 am on Friday morning. A couple of things happened to jeopardize the proposal before it even started. It seems Donna had developed a urinary tract infection and she was in terrible pain by the time we finally got to St. Augustine. In addition, I have this weird thing with my left side that gives me sharp pains sometimes. Of course, that started acting up. So, picture us getting out of the car at Publix in St. Augustine. Donna is doubled over in pain and I'm jerking like a some kind of spastic freak because of the sharp pains that keep shooting through my side. With both of us in so much pain I wasn't sure how we were going to pull off setting everything up. We got Donna some medicine, picked up the croissants and flowers and made our way to the beach. Thankfully, just walking around Publix helped my pain to subside and although Donna was still in some pain, she felt like she could go through with it. We made it to Anastasia State Park where everything was to take place around 9:30 am. 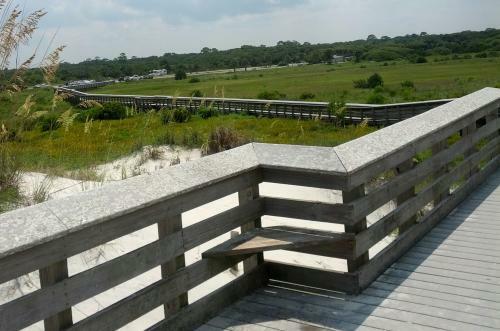 We scouted the area and found that there were two wooden docks that meandered across the dunes and out onto the beach. We decided to use the second dock so that we could tell Cory to park by the first one. What I didn't realize was how long that blasted second dock was. Thankfully, I had the presence of mind to bring a moving dolly with me because I had to carry the popup tent, a cooler, 40 pounds of weight (to keep the tent from blowing away) a wooden table and chairs and a few other odds and ends. I piled as much as I could onto the dolly and started up the dock. By now the sun was up and it was getting hot. I'll bet the dock was at least a half mile long. When I got to the end of it my heart sunk because there was a small flight of steps leading down to the sand, which was much thicker than I had anticipated. Using the dolly was out of the question, so I threw the tent over my shoulder, grabbed something else and left the rest sitting at the end of the dock. Donna managed to find the perfect location, but it was a long ways from the dock. Carrying all of that stuff through the thick sand was a bear. 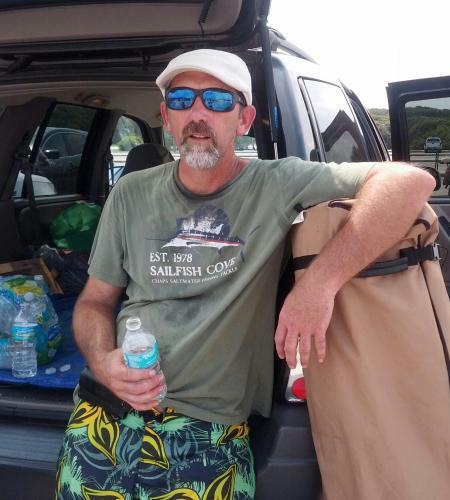 I drug the cooler because it had a handle, but it definitely wasn't easy. What almost killed me was the weights. Like a dummy I didn't put them on the dolly to begin with and I didn't think that I would need it so I carried them the entire way from the car to the tent. I definitely had to take a break after that. So, after reinserting my lungs back into my chest Donna and I started setting things up. The tent was easy and the shower curtains weren't really that bad. Actually, we had all of the sides up in a fairly decent time. The problem we ran into was that the wind kept blowing the sides back into the tent area. The twine proved to be invaluable because I was able to string a couple rows of twine that kept the curtains from blowing in. We also used a heck of a lot of the clothes pins. When we were done it looked rather nice. 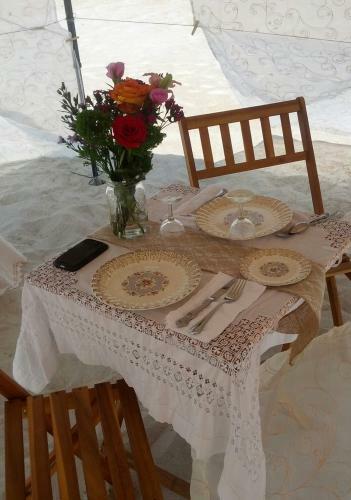 We set up the little wooden table and chairs that Donna had purchased, covered the table with a table cloth, set up the good china and viola', the tent was done. Next, we set her camera on a tripod and found the perfect hiding spot that allowed us to view the beach. I walked out and she did a couple of test pictures. It was around 11:15 and we were done. Only fifteen minutes to spare… or so we thought. About that time Cory sent a text that they were running about an hour behind. At this point Donna and I were hot, tired and she had to go to the restroom. We really hadn't wanted to make the trek back to the parking lot where the bathrooms were, but the tent was just a little farther away from the beach than we had anticipated and I had forgotten to grab her large zoom lens out of the car. Since they were running late we decided to head back, go to the bathroom and pick up the zoom lens. We had just gotten back to the car when Donna got another text from Cory – they were there!! In fact, I looked up just in time to see them walking down the sidewalk to the second dock. We both dove into the car and she texted Cory to stop and turn around. She had told him to go onto the first dock, but unbeknownst to us there wasn't really a first dock that led to the beach. The dock we had seen only led out onto the sand as an outlook. There was a path that led to the beach, but no dock, so Cory was confused by the directions. Well, she managed to get him going in the right direction and then we made a mad dash to the dock and headed to the tent. By the time we got back to the tent we were both red faced and drenched with sweat. Unfortunately, we didn't get the zoom lens. Cory had been told to go twenty feet past the tent because that was where we had the camera pointed and where we had made the test shots. I watched them walk up the beach and gave Donna updates on how far they were. They were walking and talking. 300 feet… 200 feet… 100 feet… 50 feet… 25 feet… then… they stopped 20 feet before the tent instead of 20 feet after. Was this the moment? I wasn't sure. Then, I saw Cory turn Carsen around and I knew it was about to happen. I let Donna know and she had to hustle to get the camera turned around in time. She somehow managed to get in position and started taking pictures. I watched the whole thing happen from my little peep hole in the tent. Carsen had her back turned and Cory wrote something in the sand. Then, he told here to turn around. 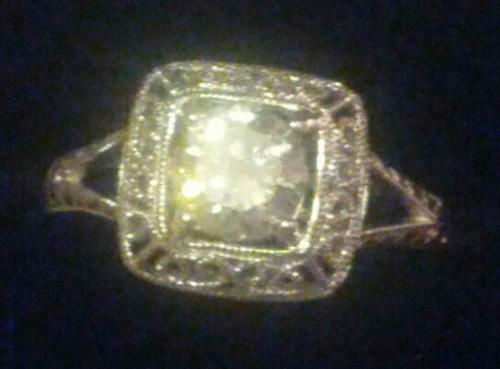 He was on one knee now and he was holding out the ring. I saw Carsen's hands fly over her mouth. I haven't told anyone this, not even Donna, but the whole thing almost moved me to tears. There was just something about seeing my son down on one knee, proposing to the woman that he loves that really got to me. Finally, after what seemed like forever I saw Carsen slowly nodding her head up and down and then they were hugging. It was very special to watch and I am so glad that I got to be there. Afterwards, they walked up to the tent. She was definitely surprised to see us there. We hugged them, sat them down and then served them lunch. Nothing really spectacular: chicken salad sandwiches, fruit, bottled water… and of course a bottle of champagne. Donna and I made the long trek through the thick sand and down the never ending dock one more time. We sat at the picnic tables in the shade by the restrooms until they called us. Cory said they didn't do much but look at each other most of the time… and Carsen kept looking at her ring a lot. I think they were both pretty much in shock over the whole thing. We spent a little time with them and then they left to do other things. Then, we got the joyful opportunity to clean everything up. Actually, it was easier to tear down than set up, but the trips back and forth were still grueling. 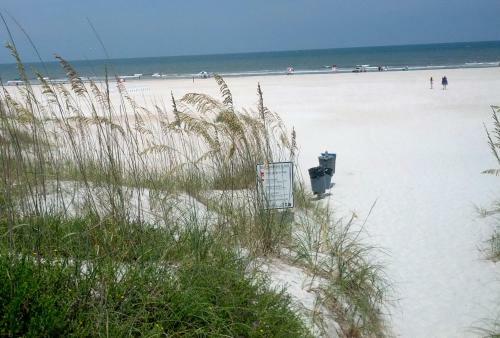 At 3:30 pm, six hours after first arriving on the beach, the car was finally packed and ready to go. Here are some pictures of my son's proposal. I've written a long version of the event and will post it soon. On Valentines day, 1987, I proposed to my wife on the beach at Anastasia State Park in St. Augustine, Florida. We're working on our 28th year together and still going strong. That's why we were both excited to help my son when he asked us to help him out with his plans to propose to his girlfriend on the same beach. It didn't actually start out to be on the beach in St. Augustine, but that's where he ended up asking her. Maybe I can write a full blown story soon, but here's the short version. This past Saturday my wife and I set up a tent on the beach. We put up some curtains and made everything look real nice. 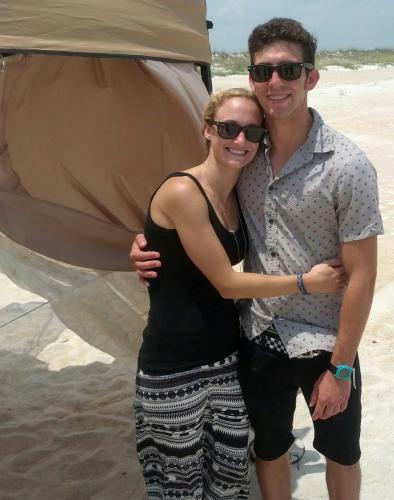 We planned it so that my son could walk up the beach with his girlfriend and when he got to the tent he turned her around and told her to close her eyes. At that point he wrote something in the sand, got down on one knee and told her to turn around. 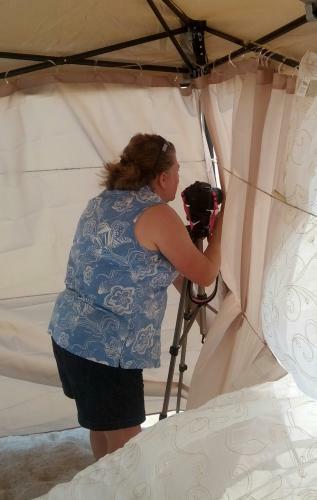 The whole time we were hidden in the tent and my wife was taking pictures. Needless to say, his girlfriend was speechless. She was finally able to shake her head yes. After the proposal they walked up to the tent where we served them lunch (we had set up a little, wooden table and chairs). There was much more to the story, but that will do for now. It was a special experience to be a part of their proposal and a memory that I will always cherish. I guess one of the most special things about it is that my son wanted us to help. It makes you feel good as a parent when your kids want you involved in their lives. I appreciate all of the concerned comments on my last entry. However, I did want to clear a couple of things up. 1) I will still continue to go to the doctor. The fact that I went to two different doctors on the same day for the same thing should prove that I am not totally against it. My whole point of the story was that those kinds of experiences are what make men hesitant to go to the doctor. 2) I couldn't go to our regular family doctor because the nose bleed started on Friday, July 4th and of course continued into the holiday weekend. I had to either go to the Express Care or emergency room because no one else was open. 3) I am monitoring my blood pressure as a result of the costly weekend. Nose bleeds could indicate high blood pressure, so I want to make sure that is not the problem. The doctor at the Express Care didn't mention my blood pressure, but the ER doctor did. Thankfully I have a way to check it at home. 4) It's been three days and I haven't had another nosebleed. 5) Most importantly... now I'm ready to get back out in the garden. I wasn't feeling well when I got home from work Thursday evening. No fever, but my head was stopped up and my voice started sounding like a croaking frog. I could hardly wait to go to bed. When I woke up in the morning I had a mouth full of blood. I spit it out in the sink, wondering what was going on. It didn't take long for me to realize that my nose was bleeding, but instead of coming out of my nose it was going down the back of my throat. My wife had been sick the week before so I asked her if she had spit up any blood. She said yes, so I passed it off. The bleeding continued throughout the day and night. I wasn't able to lay down because it would settle in the back of my throat. So, I tried to sleep in the recliner. That kind of worked, but for the most part it was a sleepless night. I tried pressure, cold packs and anything else I could think of to stop the bleeding, but nothing seemed to help. Finally, around 8:00 am I got my wife up and told her that I was ready to go to the doctor. Our insurance has a $30 co-pay for Express Care so we chose the closest one and headed in that direction. After a couple hour wait I finally got to see the doctor. He walked in nonchalantly and asked me what was wrong, despite the fact that I had already relayed that information to two other people. I told him that my nose was bleeding inside my mouth and had been doing so for a good twenty four hours. It was at this point that he took his little light, shined it inside my nostrils and said, "It looks a little inflamed." Now, I am not a violent man and I don't use foul language, but at that point I just wanted to say, "No sh@*!" and punch him right in the face. A little inflamed? Seriously? But I restrained myself and listened to what he had to say. The next words that came out of his mouth left me speechless. "Do you have any Neosporin?" My wife and I must have both looked dumbfounded because then he said, "You know what Neosporin is don't you?" We shook our heads slowly, still speechless, and he proceeded, "I want to you go home and put some Neosporin inside your nose. I'm writing you a prescription for something to dry it up." Then he was gone. I looked at my wife, "I paid thirty dollars and waited two hours for him to tell me to put Neosporin in my nose?" Needles to say, I was not impressed. We filled the prescription, thinking maybe it was something that would help, only to find out that it was just a version of Claritin. My wife wanted to take me to the emergency room. Totally aggravated, I refused to go so we headed back home. Even though I wasn't convinced it would do anything I still tried the Neosporin and took the medicine. The only thing it really did was make me sleepy. So, I figured out a way to prop myself up and somehow managed to get to sleep. My wife woke me up later that afternoon and informed me that she had called the hospital and the nurse informed her that I needed to get to the emergency room right away. I got up, spit out a mouthful of blood and begrudgingly agreed. When I got to the hospital the blood started coming out the front of my nose. My wife had to finish the registration while a nurse took care of helping me with the bleeding. We got into a room quickly, but it took a good three hours for the doctor to see me. When he did finally arrive I was reclining on the uncomfortable examination table with a spit tub full of gauze and blood by my side. I am still at a loss to explain this, but when he examined me he could not find any blood flowing. He had me gargle with hydrogen peroxide and spit into a container, but there was no blood in my throat. He had me lean forward, but the blood didn't come out of my nostrils like it had been only an hour earlier. "Well, I don't find anything wrong." I pointed to the bloody spit tub, obviously with a confused look on my face. "I don't doubt that it was bleeding, but it has stopped now." He explained what he would have done if it hadn't stopped bleeding. Basically he would have shoved two tampon looking things up my nose. He stressed how painful it would have been and told me that he didn't want to do it unless it was absolutely necessary. He showed them to me and I suddenly found myself thankful for the miraculous healing that had taken place. Then, he said something that made me shake my head in disbelief, "Do you have any Claritin at home?" "You'll need to take something like Claritin to help dry all that up." My eyelids started rapidly fluttering as images of deja vu flashed through my brain. I somehow managed to whisper, "Yes, I've got something like it at home." Then, I almost fell off the table when he said, "Good, it's going to dry out your nasal passages so if you have any Neosporin I want to you use it to keep the area inside your nose moist." So, that's how I found myself sitting in front of the hospital's account representative about thirty minutes later. "It looks like the total for your visit is going to be $650.00. How much can you pay on that today?" And that is only for the emergency room visit. I'll still get a bill from the physician and for the blood work (at least they did check at the hospital to make sure my hemoglobin levels were OK). By the time it's said and done I'm expecting the total to be closer to $1000.00. In effect, it cost me $1000.00 for the doctor to tell me the same thing that I had already paid $30.00 to hear earlier in the same day. And women wonder why men are so hesitant to go to the doctor? Last weekend my 22 year old son dropped his phone in the toilet. We tried to submerge it in rice for a couple of days, but it wouldn't turn on. He immediately wanted to rush out and get another phone, but I told him to use mine and take some time to find the right deal. He's had it a week now. I never thought I'd be saying this, but I really miss my phone. It's stupid how dependent our society has beccome on cell phones. I honestly feel like I forgot to dress properly when I'm not wearing it on my side. It's like not wearing a belt or socks. I've got a couple of apps that I use a lot that I haven"t been able to access, but what I really miss is the camera. I never realized how much I used it. For example, we put up almost two dozen jars of tomatoes yesterday. I'd love to take a couple pictures and share them on Gardenstew. The good thing is that he's found a good, refurbished phone at a decent price so I should be getting mine back soon. He had let the insurance lapse on the last phone and now he's having to pay for it, literally. I have to say I'm proud of him for taking care of his own bills. I have a feeling he won't let the insurance lapse again though. Early in our marriage my wife and I got interested in plate collecting. I don't mean plates that you eat off of, but collector's plates that have scenes painted on them. At the time there as a magazine called "Plate World" that came out every other month showing all of the latest and upcoming plates. One particular day, recognizing that it was time for the latest edition, we decided to see if we could buy it locally. We were living in Layton, Utah, serving at Hill Air Force Base at the time. "Plate World" isn't a magazine that is carried by just anyone, so we decided to drive into Salt Lake City and see if we could find it there. We had my young daughter and son in the car so I would drive up to a magazine store and drop my wife off so she could check and see if they had it. We did this quite a few times unsuccessfully and were about ready to give up when we saw another magazine store. I dropped her off and found a nearby parking space in the shade to sit and wait. After a little while I saw her walking to the car extremely fast with one hand shielding the side of her face. She opened the door quickly and slid in. "Did you find it?" I asked. "Just get out of here!" she yelled. Upon entering the magazine store, she was greeted by a middle aged man of Indian descent. "May I help you?" he asked in a thick Indian accent. She responded with, "Yes, do you carry Plate World magazine?" To her surprise he answered, "Yes, go down this aisle all the way to end and take a left. You will find it on the top shelf." She took off down the aisle, excited to finally have found someone that carried the magazine. She noticed a lot of men standing in the aisles looking at magazines. It was at this point that she started getting a little suspicious, but the clerk said they carried "Plate World" so she pressed on, anxious to see the latest issue. She walked by a few of the men and felt their stares as she passed by. As she passed by one of the men she glanced at his magazine and was shocked to see a glossy picture of a naked woman. She was starting to feel very uncomfortable, but pressed on anyway. She finally made it to the end of the aisle and took a left. She looked where the clerk had told her and quickly realized that he had misunderstood her question. There, on the top shelf, was a whole row of "Playgirl" magazines. For the first time, she took a good look at her surroundings and understood that she was in an adult book store. It wasn't too long before she was sliding into our car, yelling at me to get out of there. I sat and listened to her tell the story and did the only thing that a loving, caring husband would do in a situation like this. I laughed until I cried. Needless to say, shortly thereafter we took out a subscription to "Plate World" magazine. There is one cabinet in the kitchen that I am weary about opening. It's the one that contains the plastic ware; you know, the pitchers, bowls and Tupperware containers. It started out organized, but over the course of time has become an unorganized mess. It's gotten to the point that if just one piece is moved incorrectly it all comes toppling over. I've watched members of my family when they are putting away dishes. They open the door, toss the item in and then close it back quickly, hoping not to topple the perfectly balanced infrastructure. Then, when they want something out of the cabinet they delicately open it back up and peek around the door before opening it completely. A lot of times, when an item is taken out of the cabinet there ends up being an avalanche of plastic ware as the prize is pulled out of the stack. It's both comical and aggravating at the same time. It's our little game of kitchen Jenga. The worst thing is trying to find a container with a matching lid. It's amazing to me how we can have ten containers and ten lids, but none of them will fit together. No matter how hard I try I can never seem to find a match. And the whole time I am seeking the lid, I am desperately trying to hold the stack in place, praying that it doesn't fall over. I think all the lids in our house have ran off with the other sock that disappeared in the dryer. In order to remedy the situation we continually buy more sets of containers and lids. They seem to be fine the first time they are used, but after that first washing they disappear into the abyss and are seldom seen again. What makes it worse is that we're never smart enough to take all of the old containers and lids out and throw them away. It's like we're clinging to the hope that the wayward plastic ware will somehow find its way home. Here are some things that I have noticed happening in our kitchen. If a certain dish or utensil is needed, but is not where it is supposed to be the next best thing will be substituted instead of looking for it or, heaven forbid, actually washing it. If cereal bowls are not available, mixing bowls are used. If glasses are not available, coffee cups are used (and vice versa). If teaspoons are not available, tablespoons are used. If butter knives are not available, steak knives are used. If the dishwasher is full of clean dishes, dirty dishes will be piled in the sink. If the dishwasher is full of dirty dishes, dirty dishes will be piled in the sink. If the dishwasher is empty, dirty dishes will be piled in the sink (there seems to be a pattern here). If something doesn't come clean in the dishwasher it will remain in there and get washed over and over again in hopes that the dishwasher will somehow magically find a way to get it clean. It doesn't normally see daylight again until someone desperately needs it, at which point it will be pulled out and hand-washed (albeit rather begrudgingly). If the trash can is full the trash will stack up until I tell one of the boys to take it out. The one I tell to take it out always says, "I didn't notice that it was so full", even though they just took three minutes to carefully balance a balled up paper towel on top of the heap. Someone always tears open the cereal bag so that the cereal doesn't flow out smoothly. Inevitably, this means that cereal scatters all over the counter as soon as the box is tipped over. If I pour milk into a bowl of cereal with big flakes the milk always seems to hit dead center on the one flake that is sitting flat, causing a small stream of milk to ricochet out of the bowl and all over the counter. I never know we are out of milk until after I have poured a bowl of cereal. Boxes of cereal are put back in the cabinet with barely enough cereal left in them to cover the bottom of a bowl, but no one ever takes the blame for it. For some reason, sugar always falls off of the spoon just before it reaches its destination. If it is liquid, it will spill. If it is not liquid, it will spill. If it is grape juice, it will spill onto something that stains easily. The biggest spills always come immediately after the floor has been mopped. I have been known to remove the burner cover and then turn on the stove, only to find out that I had removed the wrong burner cover (we've had to replace a few). The toaster either burns toast or pops it up before it is done. It is easy to tell when someone ate toast for breakfast because the butter has crumbs in it or, worse yet, jelly. And finally, my personal favorite. We buy bananas. They turn black on the counter. We throw away the bananas. We buy more bananas. It's hard to believe that all of my kids have now graduated from high school. I guess a little bragging is in order. We attended a graduation ceremony for my youngest son last night. He has already completed two semesters of college by dual enrolling and plans to complete his AA degree in IT technology and then pursue a bachelor's degree in computer programming. My oldest son graduated four years ago, has completed an AA degree and is working to become a paramedic. His ultimate goal is to be a flight nurse. My daughter graduated eight years ago, is a registered nurse, has been married for nearly seven years and blessed us with our first grandson in March of this year. God blessed my wife and I with three great children and continues to bless us every single day. My daughter lives four and a half hours away, but came home for her brother's graduation. It is so good to have them all home again. I've heard other people say that they couldn't wait for their kids to leave home. My way of thinking is totally opposite of that. I love being around them and have never been in a hurry for them to leave. When my daughter left for college just after graduation my wife and I were both devastated. A little over a year later she was getting married and we knew she would never be back. Devastation all over again. But we learned to adjust and now we have a beautiful grandson that we get to spoil. We've had ups and downs like everyone else, but any time I get down I think about my kids and things look a little brighter. The Bible says that children are a blessing from the Lord and I can attest that mine have definitely blessed me.